Sweet and Sour Pork | Have kids, they said. It'll be fun, they said. Before embarking on this journey of cooking meals from scratch and not using packets or buying takeaways, our grocery load was more or less the same every week. There were some very basic items that I simply never bought. Onions. I have an intolerance to onions if they are even moderately undercooked, so I tended to avoid them. Herbs and Spices. I started this challenge using the dregs from whatever I had in my pantry. Potatoes. Seems like a strange thing not to buy because they are such an integral part of whatever I’m cooking at the moment. Fresh veges, such as capsicum, courgette, cauliflower etc. As I was retrieving the onion required for tonight’s meal, I realised that I am nearly at the end of a 1.5kg bag of them. After accusing the kids of eating raw onion (yes, I heard myself too as I said it, but in my defence, BoyChild eats chalk), I realised that I have been using them! In my cooking! Stop it! And, we have no more potatoes left! I’ve used them all. Goodness. This cooking thing must be working. We are also nearly through a bag of carrots, all the capsicums have gone and I needed to pop out to buy Cornflour from the dairy (because, apparently, I don’t own that either). I have had a tin of pineapple in the cupboard for a long time and Mr T’s favourite Chinese takeaway meal is Sweet and Sour Pork so I decided to cook that up tonight, served on rice (also, nearly run out). Cut the pork into slices or pieces and stir fry until cooked. Add in the diced capsicum, diced onion and sliced carrot. Stir fry for a further few minutes. 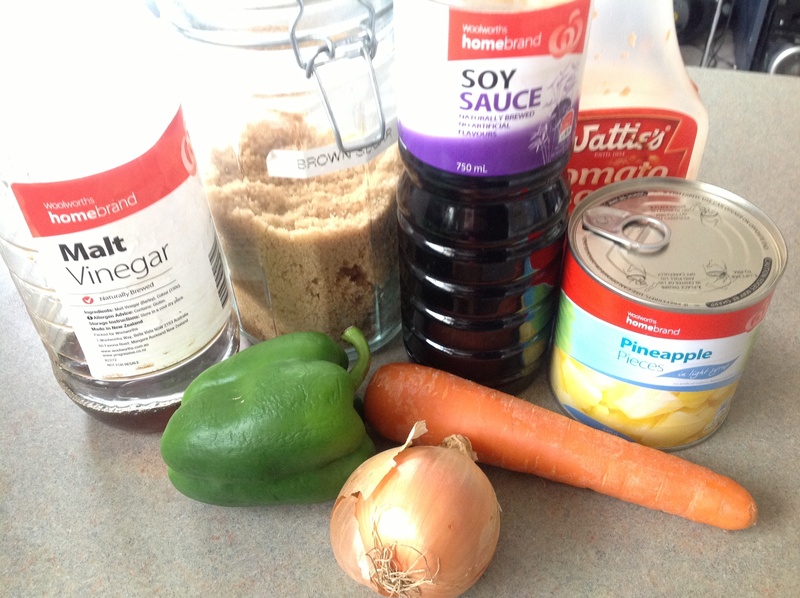 In a bowl, mix together the pineapple juice, tomato sauce, soy sauce, brown sugar and vinegar. Add in with the pork and bring to a boil, then let simmer for 10-15 minutes (until the veges are tender). Dissolve the cornflour and add to the pan, then add the pineapple. Serve over rice. I added Crispy Noodles, because, well, Crispy Noods are awesome. Win 100%. Mr T was very happy, he said it was brilliant. And, BabyGirl loves pineapple, we learnt today! This particular dish I was pretty proud of, because it was entirely from scratch, healthy and packed full of everything we want/need in a meal. Very pleased with oneself. 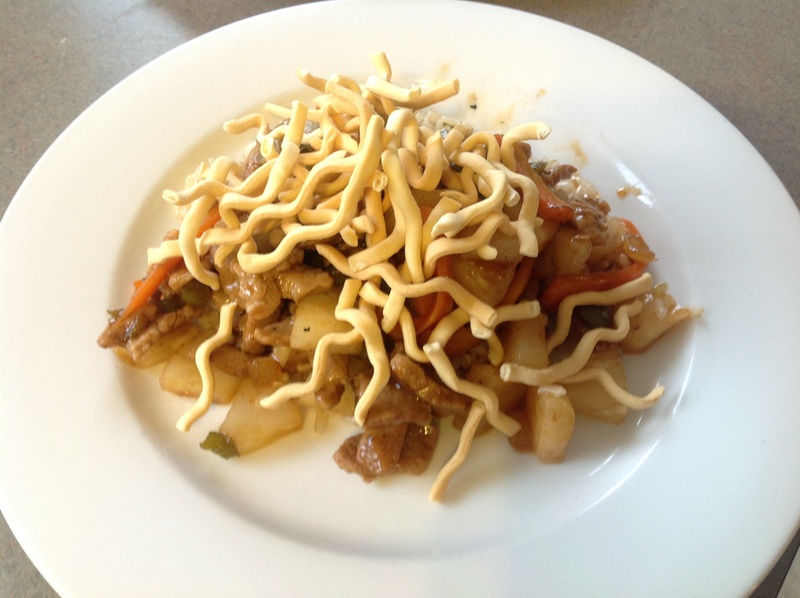 I should mention, Crispy Noods is not a typo – I used to work with someone who called them that and, well, the name stuck. Now you will forever call them Crispy Noods as well. You are welcome.